Château of Vaussieux - Site de lecampdevaussieux ! Conférence Inaugurale "Bayeux, le Bessin et le Camp de Vaussieux au temps de l'indépendance américaine"
" Mon village du temps de Vaussieux"
Circuits "Bessin au XVIII ème"
Rebuilt in 1771 by the Marquis d'Héricy on the foundations of the old Medieval Castle, this great residence became in September 1778 the military camp of Vaussieux. This Castle is currently listed as a historic monument since July 16, 1970. "The main house flanked by two wings in front of the body, has a central pavilion adorned with a large balcony and a pediment carved with a Louis XVI’s decoration. Inside, the ceilling height is impressive with a decor and period furniture. Grand piano, crystal chandeliers and fireplaces take visitors back to the 18th century. On the first floor, there are many rooms with bathrooms, tapestries and original floors. The garden has kept its luxury of the time with roses and bushes. It extends to the river behind the building "
This château has been the headquarters of General de Broglie and Marshal de Rochambeau. Several owners have succeeded since, including the last one Mr. Ira Schiltt, an American who bequeathed his heritage to a local association whose main purpose must be its maintenance and valuation. 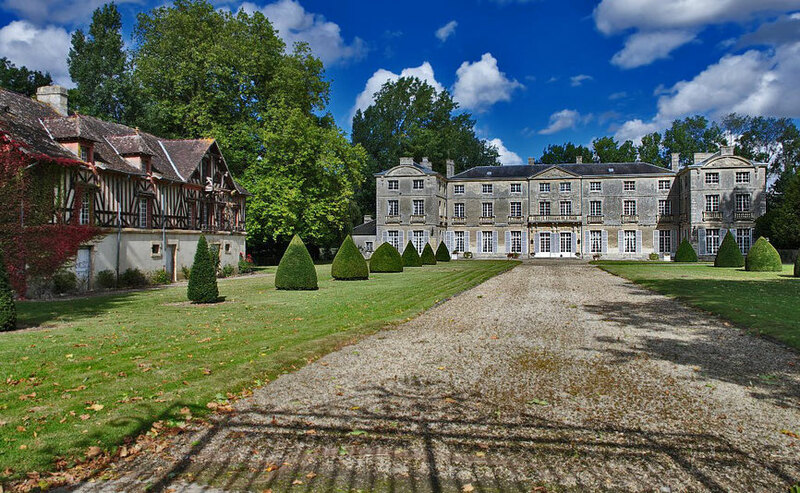 In order to respect the former owner’s wishes, this association has come closer to Un Nouveau Monde for the historical valorization of the Château of the eighteenth century : the project of Camp de Vaussieux was configured by these two associations. The association which represents the Castle wishes to perpetuate this approach and to value the Franco-American friendship born at the time of this Independence War. This link would be retained for the support of an American foundation to create a Memory Center of Franco-American friendship.